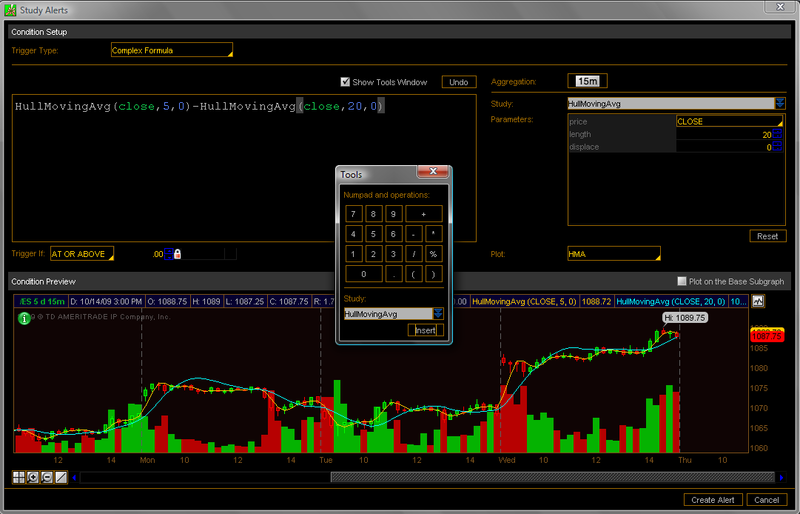 Thinkscript is the name of the code that we can use in Think or Swim charts to calculate and plot indicators. It’s a pretty simple language. If you are a code developer, then it’s no problem to pick it up by looking at some example code to figure out the syntax. Well, some Think or Swim traders aren’t developers at all. So here’s a guide to just get a script from someone else (like me) onto your charts! 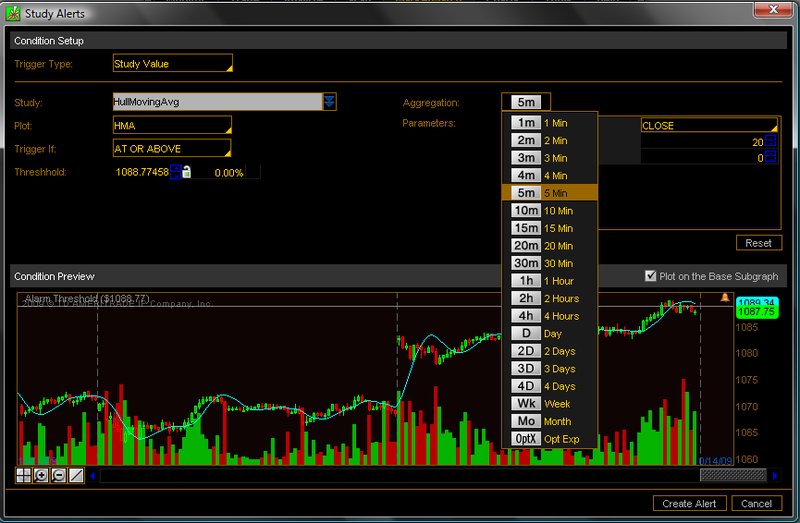 In Think Desktop, it is possible to set up an alert triggered by certain indicators. 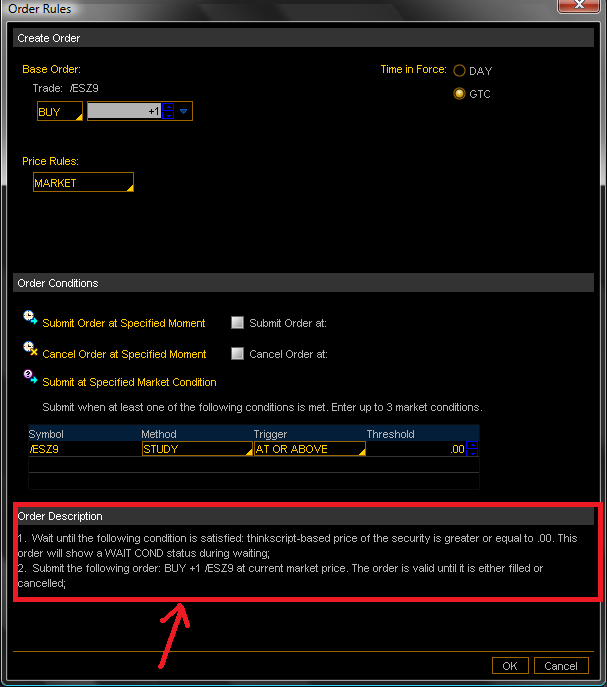 It is also possible to automatically send trade orders when your alert fires. Here’s a tutorial on how to do both! First, the bad news: As of the current time, you can only create alerts and send trades from selected built-in Think or Swim indicators. If you want to take your complicated custom study and fire alerts from it, you’re out of luck at the moment. Hopefully this will come in future releases from ToS. Trigger Type: Either “Study Value”, which uses one built-in indicator output, or “Complex Formula”, where you can calculate combinations of the built-in indicators. We’ll start with “Study Value”. Study: Pull down list of available studies you can use. Trigger If: Four choices here. At or Above, At or Below, Above, or Below. Threshhold: This is the value that you are checking if your study is At or Above, Below, or whatever you chose for “Trigger If”. If the padlock is open, it will freely float until you create the alert, and if you click it closed, the value stays frozen. Aggregation: This is the timeframe of plot that your study will be calculated against. Parameters: Here you can change the input values of your study to whatever you want them to be. 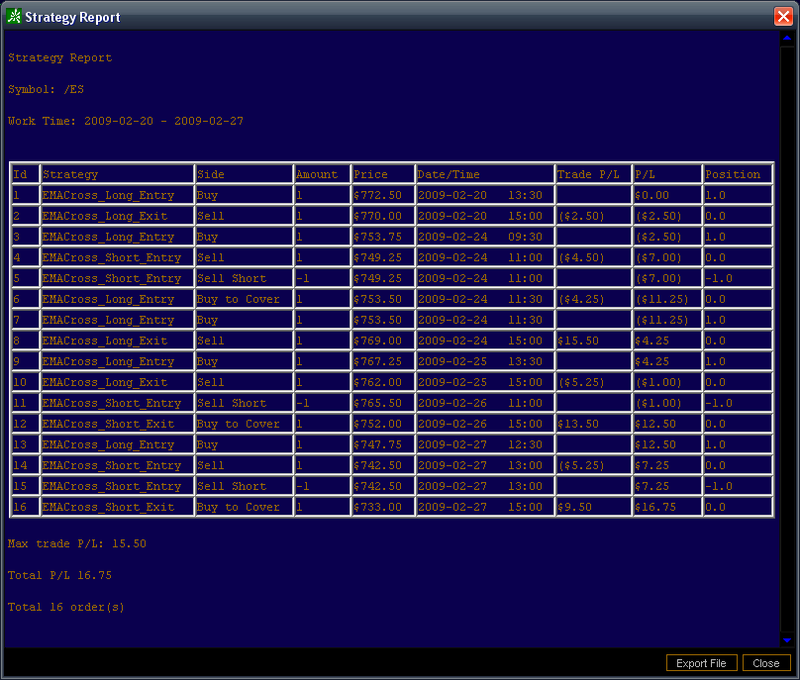 There is also a Condition Preview plot in a lower pane, so you can see what you are specifying. You’ll notice the fields have changed. Now you have a Thinkscript code window instead of the study dropdown. Here you can write code, but you’re basically limited to a single “line” of Thinkscript. Imagine that your code window has an implicit “def studyalertvalue = “, and you are just adding the rest of the code. As before, there are only some of the studies available to you (same ones as there were for the “Study Value” option). You can see them in a dropdown if you check the “Show Tools Window” box. But the real shame is that once you set up your complex formula code, you can only compare the outcome to a constant value like before. So if you want to know something like if HullMovingAvg(5) is greater than HullMovingAvg(20), then you’re stuck. But before you jump off a bridge, know that all is not lost!! You can rewrite your equation algebraically to a form that will work. Note that each alert is a one-shot deal. Once it fires, you have to go set it up again if you want to be notified next time. 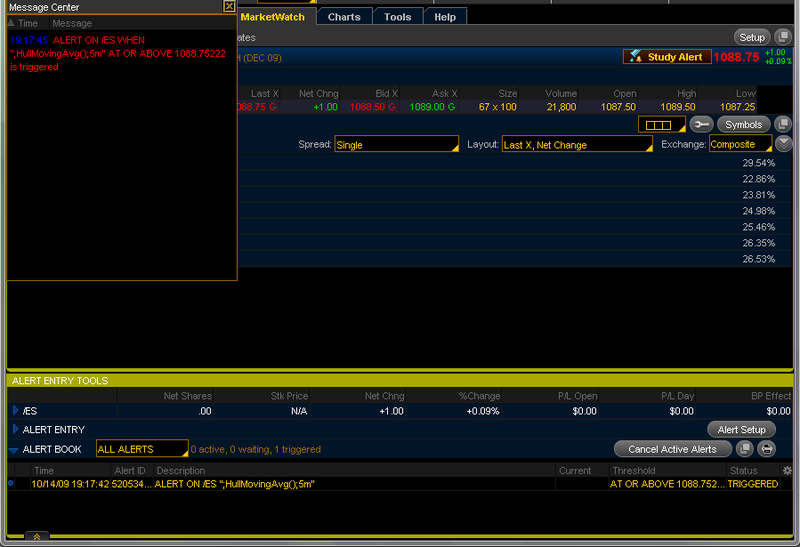 Now you can stop there with alerts only, or move on to the auto-trading realm… If you dare! 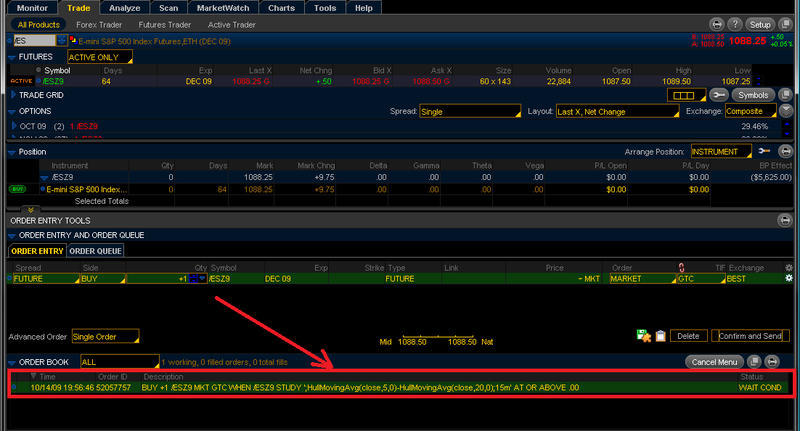 ***SPOOKY CATASTROPHIC LOSSES WARNING*** Before you let any computer take trades for you in a real money account, make SURE that you have tested it using a paper money account first, and that you understand what your alert code is doing!! Then read this warning again, and again. It will wait there until the order expires (if a day order for example), or until the alert fires. 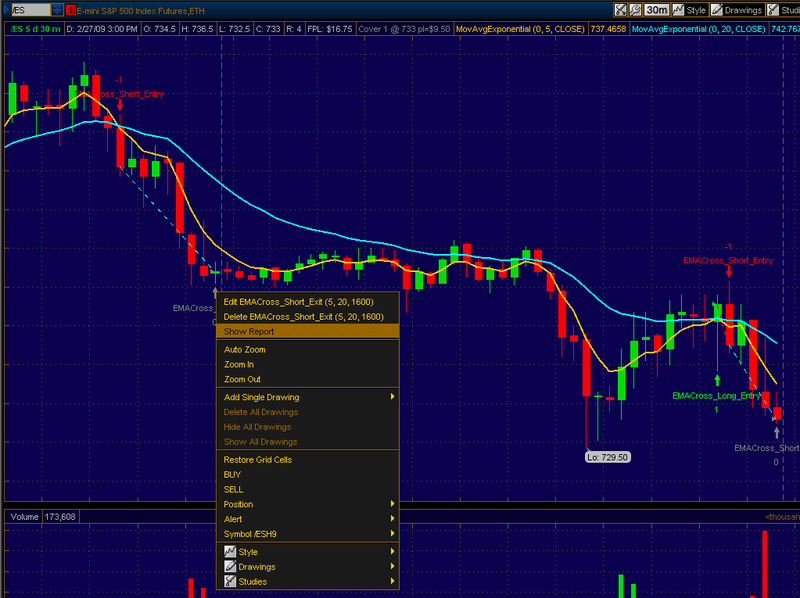 Once the alert fires, then the trade goes live and is executed according to the rules you set up. As before, once the alert trade fires, you must go set it all up again if you want to trade the next signal. The alert is held on the ToS servers, so you don’t even have to be logged in–it’s always working. However, be careful–these alerts I entered on ES actually fired in the after market and I was “filled”, so be aware of the time in force of your order or you could get filled outside of market hours, depending on what it is (options, stocks, futures, forex, etc). Make sure you test before doing anything live! Leave a comment if you have any questions, tips or observations! 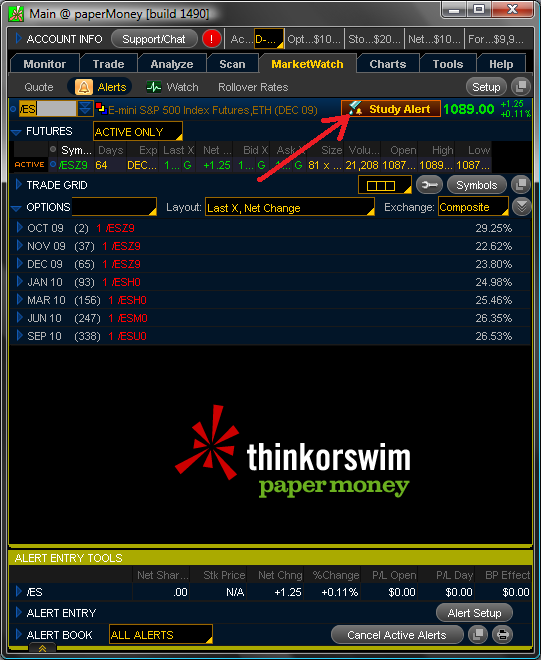 I have received lots of requests for making a trailing stop strategy work in Think or Swim. Unfortunately, due to the way that ToS currently works with strategies, there is no way to make your entry and exit strategies “talk” to each other automatically. But it is possible to get trailing stop strategies to work! It just takes some extra elbow grease. In general, any intelligent trailing stop must have knowledge of the entry point, so it knows where to start trailing. You can use “dumb” stops, like my experimental “N bar trailing stop” indicator, that just takes the low / high of N bars back and plots the value. This kind of a number is always on, so to speak. But if you want to trail a certain number of points behind your entry, for example, you can’t use the “dumb” stop method. You have to know where the entry took place. So how do you do it? The way to make trailing stop strategies work is similar to the way I made my “Volatility-based trailing stop” indicator. The key is to reproduce the entry logic in your stop strategy routine. In that indicator, I had the logic for the long side and the short side together in the same set of code. This is needed for the calculation of the new stop loss value once we switch direction. Along with this, you need to define recursive functions that perform the trailing action. In the Volatility Stop, I’m actually always calculating the values of the long side stops and the short side stops according to the ATR. There is logic to check whether that value is outside the current trailed value (ignore it) or inside the current trailed value (update the trailing stop to the tighter level). This is done for both sides at the same time. There is one more set of logic to decide if we are in the long direction or the short direction, and that tells the indicator which one to plot. Sound complicated? Actually, it’s HARDER to make the study indicator work than it is to make the strategy work! The strategy will automatically decide if you are long or short based on the criteria you give it for entries and exits. All you have to worry about is reproducing the entry logic in your exit, and the trailing logic. Time for an example. Say you want to trail a stop N-points below your entry price, and then move it up if “low-N” is greater than the prior trailing stop value. “Tigger” is the final check for your entry condition. “Orderprice” is where you put the price that you want the trade to be taken at, or the price where you would submit the order. 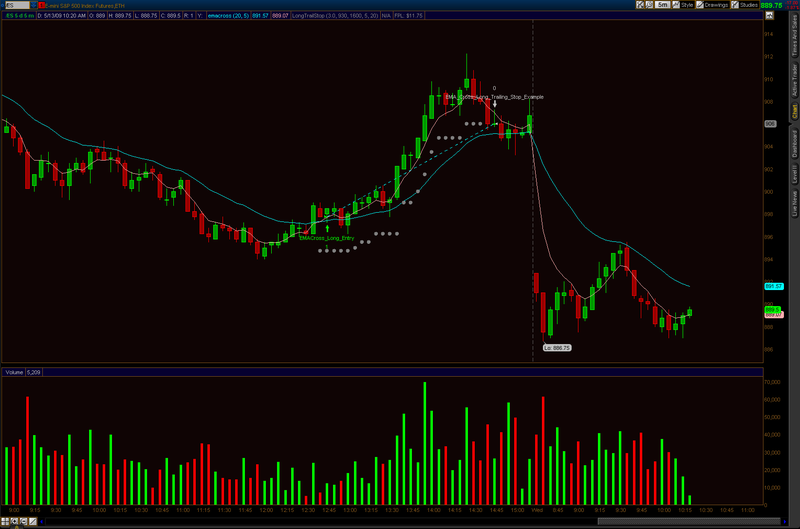 In english: If this is the entry bar then set the trailing stop N points below the order price. If it’s not the entry bar, then check if the value of low-N points > the last trailing stop value, and if it is, then that’s the new trailing stop value, but if it’s not, then keep the old one. In english: If this is the entry bar, then do nothing. If it’s not the entry bar, then if the low of the bar hit the trailing stop (or went below) then stop out, but if not, then do nothing. In english: Add the order if we got a stop out. 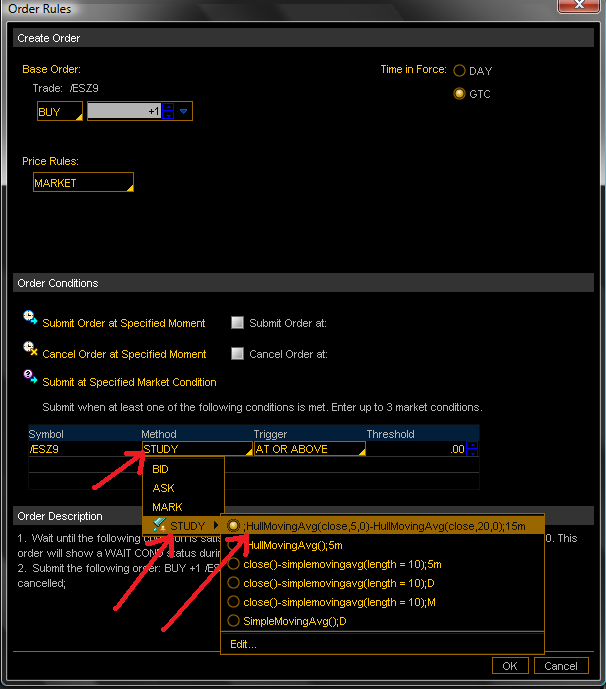 Use the value of the trailing stop as the order execution price. Trailing Stop Strategy in Think or Swim. Q.E.D. You could reverse all of this logic to get the short side strategies as well. Now you should know enough to make your own trailing stop strategies. Unfortunately, I can’t create a standalone trailing stop strategy that you can just drop on a chart. There has to be some editing and coding done each time that you want to use a trailing stop with different strategy of your own. Feel free to ask questions if you need a pointer or two while making your own, I’m glad to help out! Alternatively, if you would like me to do the work for you and create a custom trailing stop strategy to go along with an entry strategy you already have, contact me and I’ll code it for you for a flat $20 donation. 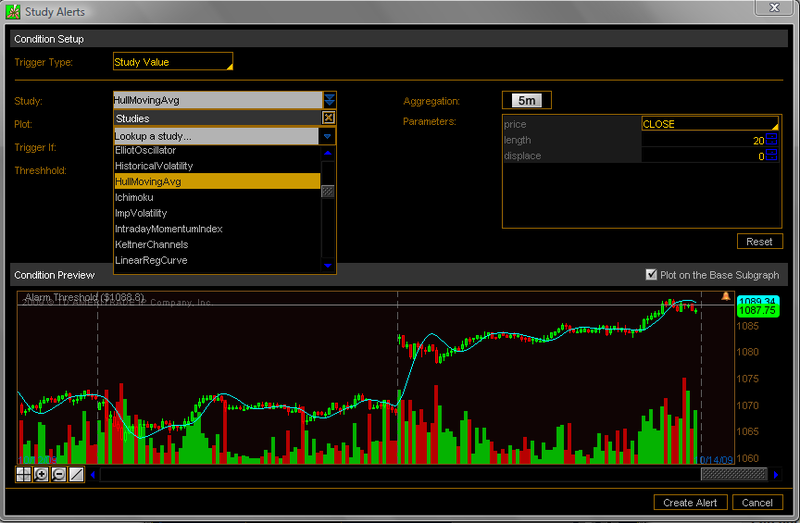 You can choose any trailing style you like–trail N-points, ATR/volatility-based, percentage-based, etc. I do have to ask for new donations even from past donors for this specific offering due to the additional time I have to put in for each request, rather than just giving access to the products of my brain, as it were. The $20 pricing is good if you already have the entry strategy file to send me. If you need the entry strategy developed too, then it becomes a custom development request, and I’ll have to give you a quote on the number of hours it will take in order to determine the pricing. Either way, if you need some work done, send me an email. 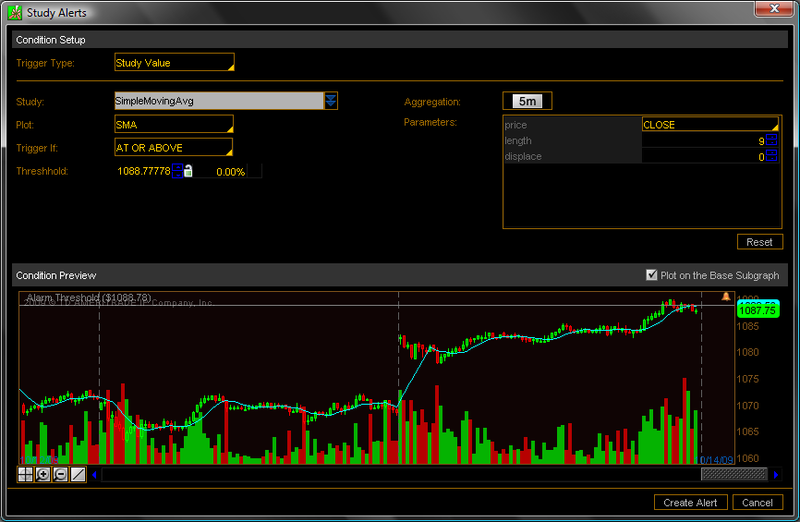 UPDATE 3-16-2009: Strategies now work on all charts, not just intraday. See code below! For each trade direction you want to use, you need at least one entry strategy and one exit strategy. For a long only method, you would need at least one “LONG_ENTRY” strategy and one “LONG_EXIT” strategy. If you go long and short, you need at least one of each of the four types. I say “at least” above because you could have more than one entry or exit strategy per trade direction, i.e. one “LONG_ENTRY” and two “LONG_EXIT” strategies, where one exit might represent a profit target and the other one a stop loss. The order is triggered if condition = 1, and the price specified is the “fill” price. I give an example of this later on. Once you have the ENTRY or EXIT declaration made with an “AddOrder” statement, you have all the required pieces of a strategy. The rest comes in fleshing out the details of your trade signals that will set condition to 1 and decide what price to fill at. One gotcha is that the order will be added on the bar AFTER condition is true. If you use condition[-1] and price[-1] then the strategy will intuitively appear on the bar you are calculating it from.Just use condition and price with no offset. The [-1] jacks stuff up in real time. Sorry. 😦 Those are the strategy basics. You can see the available strategies in the list on the left. 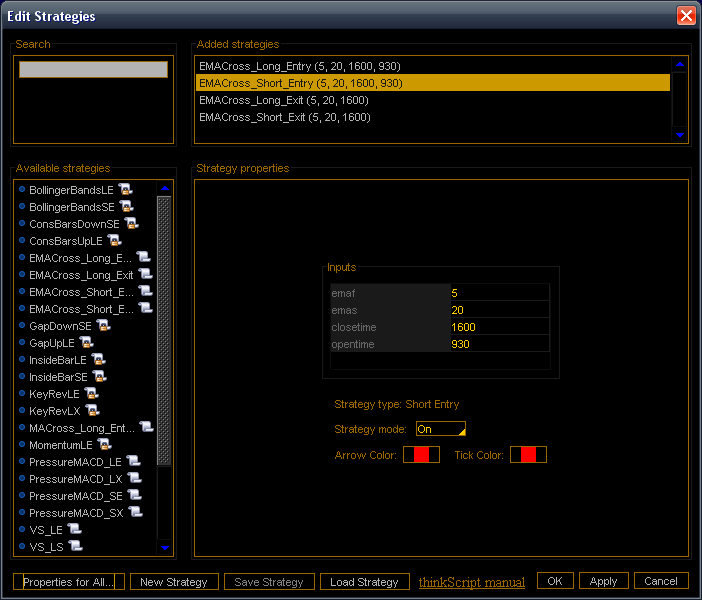 You can create new strategies or click on an exsisting one to edit it or see the source code. You can also save and load strategies to/from a folder on your computer. You add the strategies to your chart just like you add studies. In this example, I have added strategies I wrote based on an exponential moving average (EMA) cross. This method trades both long and short, so I need at least 4–one LONG_ENTRY, one LONG_EXIT, one SHORT_ENTRY and one SHORT_EXIT. This is not a recommendation to use this EMA cross method!! It will probably lose you money. I give it as a simple example that is easy to understand. 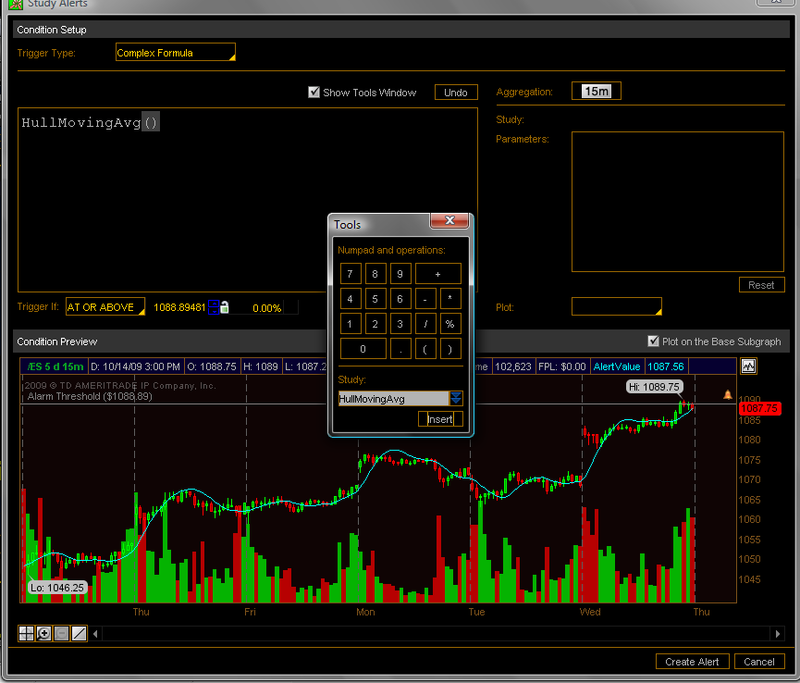 First, you can set the number of simultaneous trades to be taken. I leave mine set to 1 for simplicity. Second, choose the size of the trades. For stocks, it’s the number of shares. For futures, if you enter 1 your P&L from the strategy report will be in points. 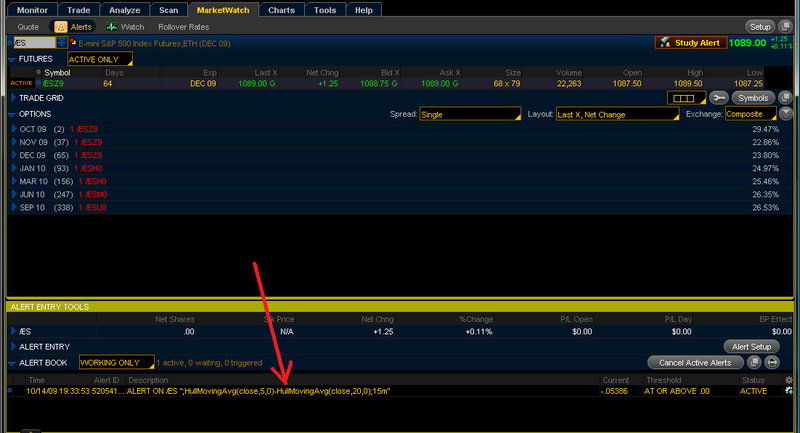 If you want P&L in dollars, enter the dollars per point of your contract, i.e. 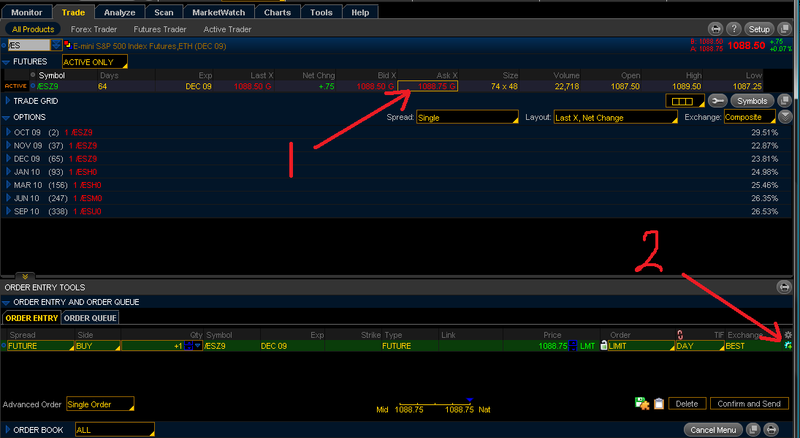 50 for ES, 20 for NQ and 5 for YM. 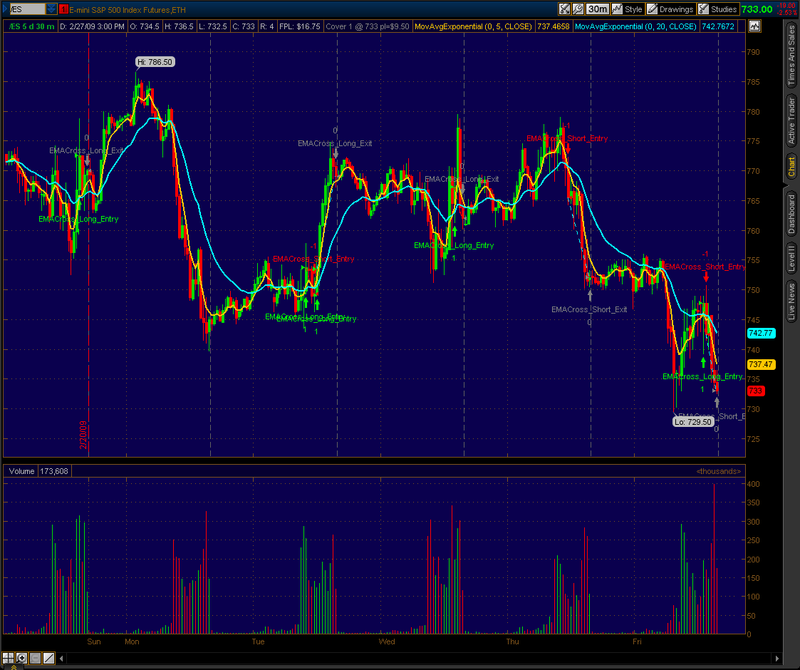 You can see that we went short right after the open on the first day. 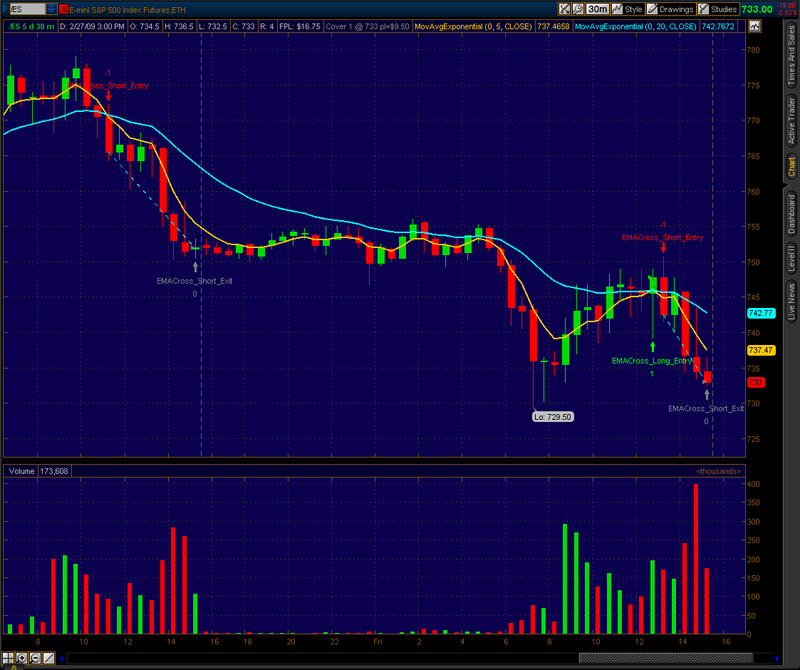 When the fast EMA crossed under the slow one on a bar closing basis, I went short at the closing price of that bar. The strategy exits at the close of the day. The next day, we get whipsawed with a long entry followed by a short entry. There was actually a signal for a LONG_EXIT at the same time as the SHORT_ENTRY, but the new entry signal takes precedence on the chart. The strategy basically went from long +1 to short -1 in the same instant. This will only happen if your entry signal one direction is the same as the exit signal the other direction. Otherwise you’ll see both when they happen. Finally, we exit the short at the end of the day. The report shows things like trade time and direction, trade P&L, overall P&L at the time of the trades, highest profit trade, and the overall P&L for the test. Notice that this method did well with a positive profit; almost any trend-following method has been doing well in this market. An EMA Cross method will get disemboweled during a choppy range-bound market, as will any trend-following method. I’m working on an Excel-based post processor that will generate more information, such as win rate, loss rate, expectancy and so forth. Look for that soon Here’s the post processor! And that’s it! To help you get started on your own strategies, you can download my Thinkscript Strategy files for the EMA Cross Method and load them into your own list, or use my Strategy Template files as a starting point to make your own.